Did you know: the most stolen book in Exclusive Books stores is the Bible? EB have revealed that the most popular genres for light-fingered customers are religion, mind & body, business & self help. ( Thanks to the Mercury Newspaper for this snippet). Bookworm comment – surprise, surprise; I suppose lavish photographic books in coffee table format filled with exciting nudes are too big to cram into one’s backpack. Or is it a sign of the age ? we’re all earnestly trying to improve ourselves? 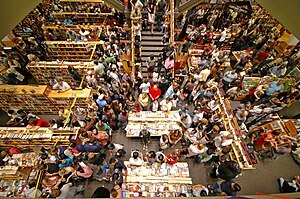 Did you know: The largest bookshop in the world is Barnes & Noble, NYC. 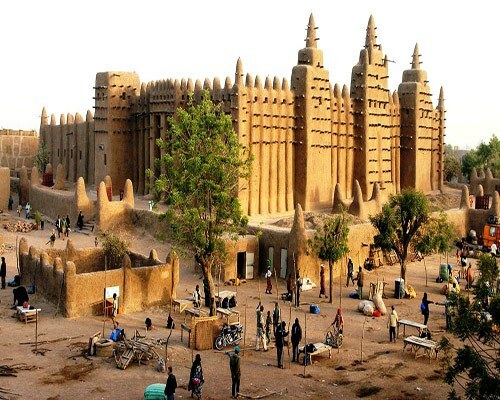 It has 20.71 km of shelving and covers an area 14 330 sq metres. (Thanks to the Mercury Newspaper for this snippet). Bookworm comment – I’m quite surprised; I would have thought Kinokunia, in Sydney, (my favourite bookstore in the whole world) might have claim to this title. I have lustful dreams about Kinokunia, Sydney. Did you know: The fastest selling book of fiction in 24 hours is Harry Potter & the Deathly Hallows by JK Rowling with 8.3 million copies or 345 833 an hour (July 21, 2007). (Thanks to the Mercury Newspaper for this snippet). Bookworm comment – how I wish HP were my creation ; apart from the fame there’s all that lovely money …. I’m not too sure who’s currently on the Richest Women in the World List (apart from HM, the Queen) but JK Rowling must be on that list somewhere. Did you know: A new book is published every 15 minutes in America. (Thanks to the Mercury Newspaper for this snippet). Bookworm comment – somehow this statistic depresses me dreadfully. Did you know: The first novel ever written on a typewriter was Tom Sawyer. (Thanks to the Mercury Newspaper for this snippet). Bookworm comment – Who would have thought that good ole’ Mark Twain, he of the luxuriant hair & mustachios, was a technological ground-breaker in 1876? One hundred and fifteen years ago at time of writing. I wonder which book will have the sad fame of being the last book ever to appear in printed form on paper, in years to come? 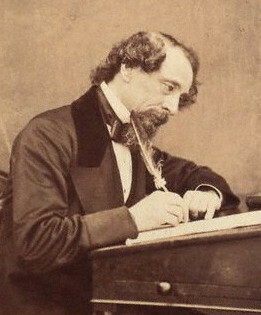 Did you know: Charles Dickens had to face north before he wrote anything. Thanks to the Mercury Newspaper for this snippet). Bookworm comment – ag shame! But still, he wrote reams, and we all have our own little foibles, don’t we? 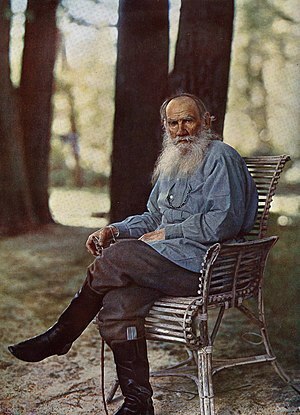 Did you know: It took Leo Tolstoy six years to write War & Peace. His wife had to copy the manuscript seven times, by hand . (Thanks to the Mercury Newspaper for this snippet). Bookworm comment – Mrs Tolstoy deserves a medal, at the very least, but who gets the fame & acclaim? No prize for the answer. Did you know: The fastest selling book of fiction in 24 hours is Harry Potter & the Deathly Hallows by JK Rowling with 8.3 million copies or 345 833 an hour (July 21, 2007). (Thanks to the Mercury Newspaper for this snippet). Bookworm comment – how I wish HP were my creation ; apart from the fame there’s all that lovely money …. I’m not too sure who’s currently on the Richest Women in the World List (apart from HM, the Queen) but JK Rowling must be on there somewhere. Did you know: A new book is published every 15 minutes in America. (Thanks to the Mercury Newspaper for this snippet). Bookworm comment – somehow this statistic depresses me dreadfully. snippet). Bookworm comment – Who would have thought that good ole’ Mark Twain, he of the luxuriant hair & mustachios, was a technological ground-breaker in 1876? One hundred and fifteen years ago, he was bashing away at his Remington. I wonder which book will have the sad distinction of being the last book ever to appear in printed form on paper, in years to come? It’ll be Kindle, Kindle all the way. THIS WEEK’S QUESTION: Could – or should – JK Rowling write a non-Harry Potter book? What do you think ?